The hellfire preacher Girolamo Savonarola was hanged and burned on this day in 1498 in Piazza della Signoria in Florence. 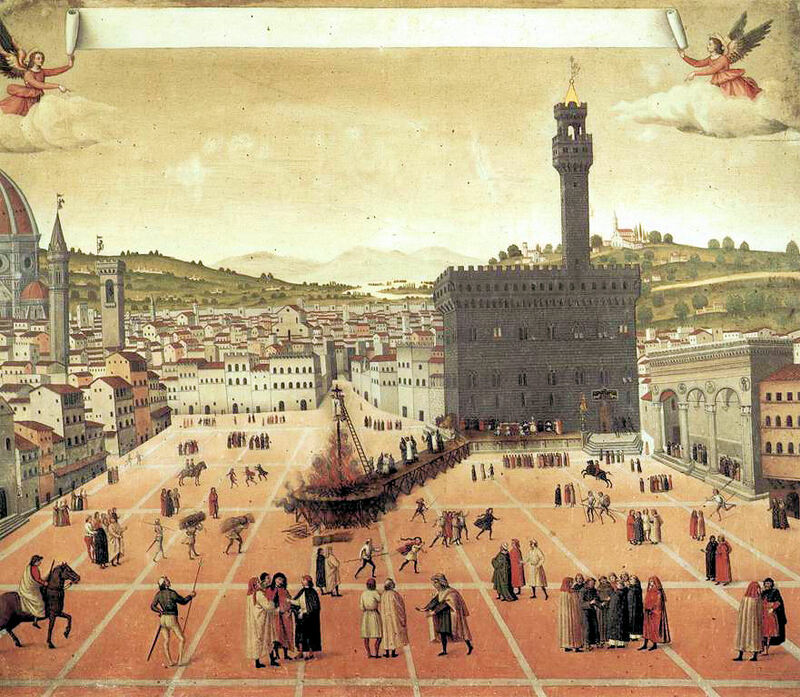 By sheer force of personality, Savonarola had convinced rich people to burn their worldly goods in spectacular bonfires in Florence during 1497, but within a year it was Savonarola’s burning corpse that the crowds turned out to see. This phrase inspired Tom Wolfe to write The Bonfire of the Vanities, a novel about ambition and politics in 1980s New York. 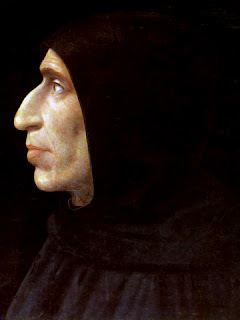 Savonarola was born in 1452 in Ferrara. He became a Dominican friar and entered the convent of Saint Mark in Florence in 1482. He began preaching against corruption and vice and prophesied that a leader would arrive from the north to punish Italy and reform the church. When Emperor Charles VIII invaded from the north many people thought Savonarola’s prediction was being fulfilled. At the height of Savonarola’s success the Medici were driven out of Florence and he became leader of a republican movement in the city. Savonarola’s sermons against vice in the church attracted the attention of Pope Alexander VI, who excommunicated him after he defied his orders. Eventually popular opinion also turned against Savonarola and he was arrested. Under torture he confessed he had invented his visions and prophecies and he was condemned to death. Ferrara in Emilia-Romagna, where Savonarola was born, was the city of the Este dukes. With its winding cobbled streets, medieval houses and stunning castle, it is well worth visiting. You can still see the spot in Piazza della Signoria in Florence where Girolamo Savonarola was executed. The Piazza has been at the heart of Florentine politics since the 14th century and is like an outdoor sculpture gallery, with magnificent statues commemorating major events in the city’s history.